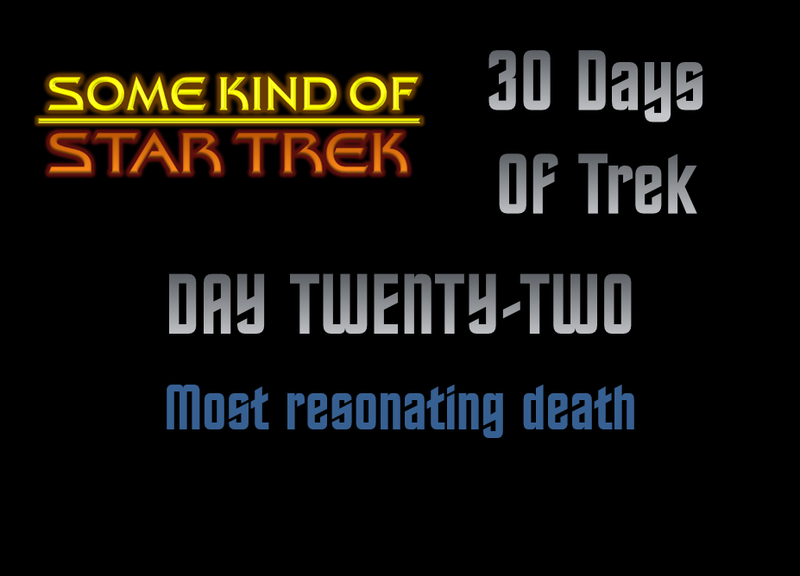 We're into the final days - just eight questions left in the 30 day challenge! So to most resonating death - and note I haven't said death scene here for a reason. Thre have been a lot of deaths in Star Trek be it main cast or guest cast and while the moment they passed is a monumental moment for the franchise, what about the aftermath and the effect it had on the universe? Which one resonated with you the most? Was it indeed the death of a guest character such as Vedek Bareil? Maybe it was Trip's shock exit in These are the Voyages, the passing of Picard's brother and nephew in Generations or did the death of Tora Ziyal in Sacrifice of Angels drive you to tears? Let's find out today. I decided on the demise of Jadzia Dax in Tears of the Prophets but not for the moment in which Dukat, possessed by the Pah-Wraiths, kills her. 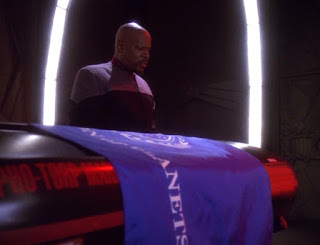 Instead it's for the magnificent scene in which Sisko watches over her torpedo tube coffin (marked identically to Spock's in The Wrath of Khan) in which he mulls over his actions - what has happened and what he intends to do. 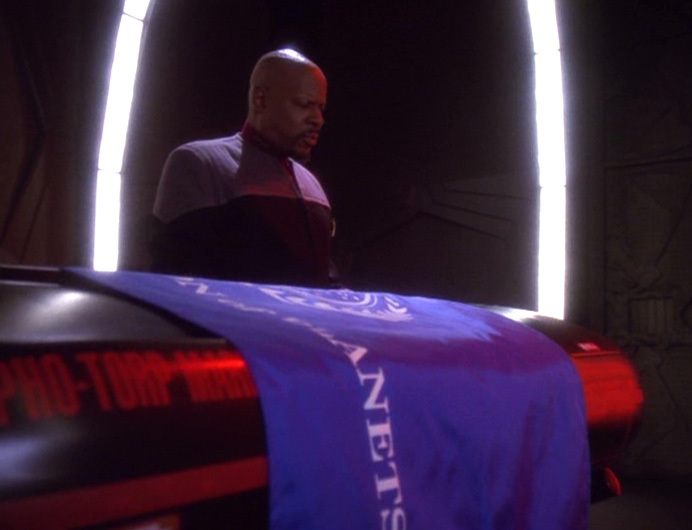 He only just manages to lay his hands on the coffin as the scene ends but the effect of that death carries through to his leave of absence returning to Earth and taking the symbolic baseball with him. This scene is Brooks at his most impressive - not in a raging fire of anger but contemplative and almost apologetic for what has happened even though he was nowhere near at the time. It was even covered in the great Star Trek Action! book which is well worth picking up. The death of Jadzia also brings in a new host for the symbiont and throws up a whole new set of variables in the final season especially between Worf, Bashir and the arriving Ezri. Even though there was a single season left to run, Deep Space Nine continued to take chances and dare to be different. Dax had been a key figure in the first six years and things seemed to be moving in a new and unexpected way for her as the season progressed with first her marriage into the House of Martok in You are Cordially Invited and then in the finale, the possibility of starting a family. In the final year we get the opposite, an inexperienced counsellor with a mind full of eight lifetimes of experiences and barely able to comprehend what she has inherited. Truly a big turnaround from her predecessor and made for some great stories in the last year. So what's your pick? I suspect I can guess a couple that might come up but I'm ready for some surprises! Question twenty-three will be with you tomorrow!